The ziggurat you're looking at is John Russell Pope's 1912 design for the Lincoln Memorial. This design and plans for other kooky alternate history monuments are currently on display at the National Building Museum in Washington, DC. Check out parallel universe versions of the Capitol, the White House, and other never-was monuments, like the Washington Dolphin Hotel. The National Building Museum will have this exhibit on display until May 28, 2012. Here are several of the unused designs, and you can check out an interactive map of the monuments' would-be locations. A video showcasing some of this speculative city planning. Main elevation of Capitol competition entry by James Diamond, 1792. Many entries to the design competition for the "Congress House" were by amateurs, including this one notable for its crudely drawn weathercock. Winning Competition Entry for the Washington Monument by Robert Mills, 1846. 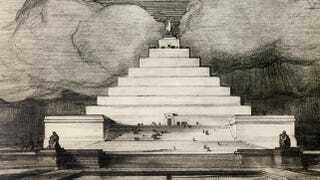 Mills's original proposal called for an obelisk anchored by a circular, Greek-inspired temple at the base. The base was never executed, and the proportions of the obelisk itself were changed when the structure was finally completed nearly four decades after this drawing was produced. Proposed design for the US Capitol with high dome by William Thornton, c. 1797. Proposal for the completion of the Washington Monument by Vinnie Ream Hoxie, c. 1876-78. Construction of the Washington Monument began in 1848 but was halted in 1856, leaving an unfinished stump on the National Mall for more than two decades. In the 1870s, various architects and others proposed ideas for finishing the monument, often in unexpected ways. Proposed Memorial Bridge in Honor of General U.S. Grant by Smithmeyer & Pelz, 1887. The proposed site was roughly the same as the current site of the Memorial Bridge. Rendering of the proposed National Sofa, to be located across Pennsylvania Avenue from the White House, by Jim Allegro, AIA, and Doug Michels, 1996. Allegro and Michels were concerned that the closure of Pennsylvania Avenue following the Oklahoma City bombing would further isolate the presidency from the people. They proposed the National Sofa as a place of virtual and physical interaction to address that gap. Proposed Extensions to the White House (Executive Mansion) by Robert Owen, 1891-1901.This was one of several proposals in the late 19th century for expanding or relocating the Executive Mansion to provide more space for a growing government. Owen proposed creating two approximate replicas of the original building, rotated 90 degrees in plan and placed to either side, forming an open court with a greenhouse at the south end.